Exploded view diagrams are very useful for communicating technical information is an easy to understand manner. They show various parts and pieces of a manufactured item or product in a “pulled apart” manner, with lines and visual aids to help the viewer understand where each part fits, and sometimes even in what order. 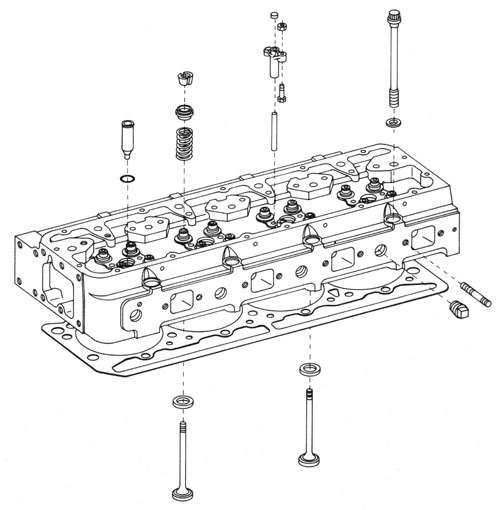 In this case, an engine head is shown with the gasket, and various pins, washers, springs, seals, and plugs extended away and in line with where they fit. This particular technical exploded view diagram is done in a “pen and ink” style, and can easily be replicated in a vector-based software program like Adobe Illustrator.